Ben Franklin's Poor Richard's Almanac is often given credit for the old adage that if you lay down with dogs, you're going to get fleas. Perhaps the real genesis of this sentiment comes from the above biblical verse. This is not merely a proverb from Solomon about life principles. The Apostle Paul is teaching the new believers in Corinth about the dangers of associating yourself with false teachers. You can have all of the good intentions you want -- God does not care about them. You can strive for good morals but who you line up with will direct your moral path more than your desires or intentions. This is why you do not lend your credibility to people who have not earned it and do not deserve it. This was the case several years ago when I addressed Dr. Michael Brown on his radio program about his decision to appear for a week on the Benny Hinn television program. At the time Dr. Brown insisted that he did not really know a lot about his teachings. Recently I appeared again on his program, as a guest this time and not just a caller. This was to discuss recent criticism, including mine, about who Dr. Brown continues to share the stage with that is irreparably damaging what was once a sound reputation. Early on he admitted that if he had to do it over again he would not appear with Hinn, although the reason offered was that he reneged on airing the last taping. By the end of the appearance, Dr. Brown admitted that he sees no reason to not consider Benny Hinn as a brother in the Lord. That alone disqualifies Dr. Brown as someone to take seriously. Mind you, I am again not speaking about intentions as I can believe that he is well intended. This is about biblical discernment. Benny Hinn should be low hanging discernment fruit. Despite his false prophecies and false teachings over the years, congressional investigations into his finances and his propensity to waive a magical suit coat to "heal people," Hinn is still a charismatic darling and if there is one huge blind spot Dr. Brown has it is Charismania. "Spiritual Formation and Community is designed as hands on learning experience for students to put into practice the disciplines they are learning in the school.ie: prayer, worship, community, study, words of knowledge, prophecy, healing, etc." "This course is designed to give students an overview of the purpose of prophetic ministry, a historical understanding of prophetic ministry in the Bible, the characteristics and creation of a healthy prophetic culture, and practical training in operating in the spiritual gift of prophecy." So according to Bethel, the gifts of the Holy Spirit are "disciplines" that can be taught. That they can provide practical training in operating in the spiritual gift of prophecy. The language is plain and clear and consistent throughout the poisoned minds affected by Bethel and Bill Johnson. I watched a training video from Bethel for worship leaders instructing them in a made up concept called "prophetic worship"; where they tap into their deceitful heart, assume what they hear is from God and sing it over and over again as a mantra. I saw this once live at a local church where the guest worship leader kept singing for over 15 minutes -- "jump in the river if you want a hug from Jesus." It was just utter nonsense. Despite the obvious fact that my criticism is correct, Dr. Brown still defends Bethel and insists I am wrong. So today let us look at the most recent example proving Dr. Brown is sorely mistaken. 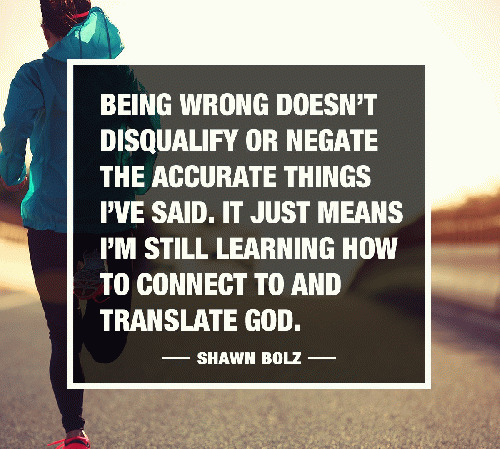 Shawn Bolz is the resident false prophet dude from Bethel. His specialty is falsifying "words of knowledge." Let us first deal with what this gift is because there is some debate. The reason why there is some debate is the Bible never truly defines it. Those outside charismatic circles refer to words of knowledge as factual insight into the Word of God. While we are all supposed to do the work of Bereans for ourselves, we all know there are some who clearly are more gifted at the understanding of Biblical texts. I could even go as far as to say that under this explanation, Dr. Michael Brown could be accused of possessing this gift. This is not to be accused of the gift of wisdom, which under this paradigm is the ability to take biblical knowledge and correctly apply it. That is what Dr. Brown appears to be sorely lacking. Let me give you a practical example. Dr. Brown has written possibly the defining book speaking against the greasy grace error known as antinomianism. He clearly displays a grasp on Scripture to explain why we need to be very careful in applying a grace only model. Yet when I asked him about Joseph Prince, who is the current king of antinomianism, Dr. Brown refused to call his teachings false. He said he was a good brother in the Lord who had some holes in his theology. No Dr. Brown, he is a vicious wolf devouring the sheep of the Lord. This perfectly illustrates how one can have a gift of knowledge but lack the wisdom to correctly apply it. It is fantastic to have the ability to theologically understand why antinomianism is heretical but relatively useless if you cannot use that knowledge to rebuke, mark and avoid people who actually teach it.